So far, it’s a show that only plays on the road but it looks as though the Toronto Maple Leafs can declare they found their next great duo. Joining the likes of Darryl Sittler and Lanny McDonald, Doug Gilmour and Dave Andreychuk and Mats Sundin and Jonas Hoglund (just kidding) are John Tavares and Mitch Marner. This, of course, has been the dream of the Leafs and their fans since Tavares was lured to his hometown team in the summer with a seven-year contract that pays US$11-million a year, and it was announced his dancing partner would be Marner. There were glimpses of what could be in the preseason and the pair started the regular season with a rush. But as the Leafs as a group slowed down in the past two weeks and then lost Auston Matthews for a month to a shoulder injury, the doubts took hold. 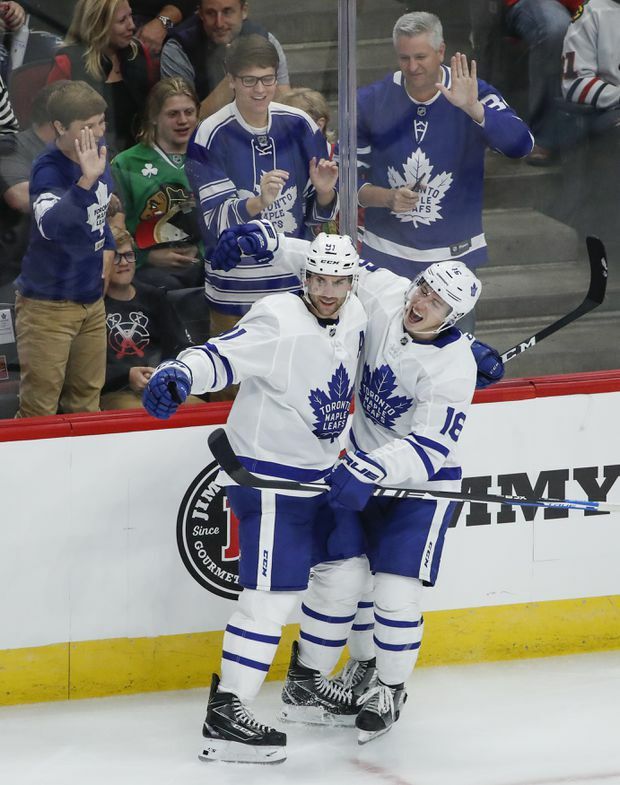 Toronto Maple Leafs center John Tavares celebrates with center Mitchell Marner after scoring against the Chicago Blackhawks during the third period of an NHL hockey game on Oct. 7, 2018, in Chicago. After bagging four assists against the Detroit Red Wings on Oct. 11, Tavares had just four points in his next four games through Nov. 1. It was not an ideal time to grow cold with Matthews on the shelf, and the Leafs lost their first two games after Matthews was hurt on Oct. 27. However, both Tavares and Marner showed a flair for the dramatic when they combined for their best game in weeks by outplaying Sidney Crosby and his linemates for a 5-0 win over the Penguins in Pittsburgh on Saturday night. It was the Leafs’ first win without Matthews and re-established the team’s confidence it can flourish despite his absence. The shutout also kept the Leafs’ road record perfect at 6-0-0. Nothing showed the pair’s synergy more than Tavares’s goal at 9:34 of the first period against the Penguins. The play started when Marner, who uses his speed and skill with his stick to be a defensive force in his own end, pounced on a loose puck in the Leafs zone and took off down the left side. Tavares joined him and as Marner weaved his way into the Pittsburgh zone, Tavares went to the net while keeping one eye on Marner. When Marner drifted the puck to the net, Tavares was in perfect position to tip it behind goaltender Matt Murray. The goal pushed over a lot of dominoes for the Leafs. It showed the possibilities for Tavares and Marner are starting to become reality. Also, it was seemingly the first time in months they scored the first goal of the game, relieving the Leafs of the burden of chasing the game. The Leafs, by the way, are 4-0-0 when they score first. By the end of the night, Tavares had a goal and an assist and Marner had two assists. Crosby, who played against Tavares for most of the game, finished at minus-3. For his part, Tavares believes he and Marner are just beginning to show what they can do together. Marner thought they clicked more often than they have in recent games by not trying to be fancy when they were entering the offensive zone. Until the Penguins game, there were too many turnovers in the neutral zone and too much getting pushed to the outside. “We were moving the puck, we were skating a lot and I think we were putting the puck behind their [defence] a lot,” Marner said. “We weren’t fooling around with it at the top of the circle and blue line. The trick now, Tavares said, is to repeat the performance at home. While the Penguins game almost seemed like a home game given the large number of Leafs fans who made the trip to Pittsburgh, the Leafs still sport an embarrassing 3-5 mark in their own building. They have two chances to change that, beginning Tuesday against the Vegas Golden Knights and finishing Friday against the New Jersey Devils before a stint on the road.